Monday afternoon delivered additional showers with 1-5 inches of snow falling above 10,000 feet. Expect afternoon showers every day this week and weekend, accumulations will be scattered, and the driest day might be Wednesday (low confidence). Next week, a weak and warm storm should bring steadier high-elevations snowfall from late Monday into Monday night. Pay only $49 down now to ski Vail, Whistler Blackcomb, Heavenly, Park City and MORE with the Epic Pass next season. Get 2 Buddy Tickets when you buy before May 27! Visit EpicPass.com to lock in your 2019-20 pass today. Sunday afternoon brought showers, Monday afternoon brought showers, and I see the same general pattern for the rest of the week. The showers on Monday afternoon dropped 1-5 inches of snow near and east of the continental divide. 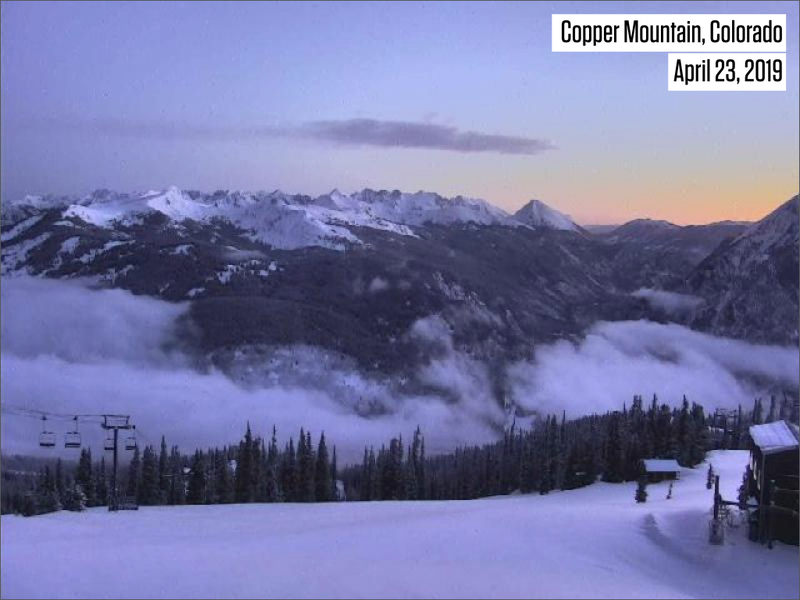 Arapahoe Basin and Loveland show about 1 inch on their snow stake cams, Breckenridge is reporting 5 inches (their snow stake cam is not working), and nearby at Copper Mountain (which is closed), their snow stake cam shows 3-4 inches. With warm temperatures, all of this snow fell near and above 10,000 feet. Now on Tuesday morning, we are again seeing clearer skies with lingering low clouds that should dissipate as the sun rises. The main storm that brought showers on Sunday and Monday is now delivering the most precipitation to the south of Colorado. However, there will be enough moisture and energy lingering over Colorado that we’ll continue to see afternoon clouds and showers from Tuesday through Sunday. I received a few questions via email about which day this week would be the driest and sunniest, and it’s hard for me to answer this question as each day could have showers. Wednesday might be the driest and sunniest day, though my confidence is low. As I mentioned above, afternoon showers will continue for the rest of this week and through the weekend. Then all models show a storm crossing Colorado on Monday or Monday night (April 29). As the storm moves into Colorado, expect 6-12 hours of potentially steadier precipitation, though due to warmer temperatures, most of the snow will stay near or above 9,000 feet. The higher peaks could get at least a few inches, and maybe 6-8+ inches depending on how the storm sets up. This will not be a cold, powdery snowfall, but it will be snow none-the-less. 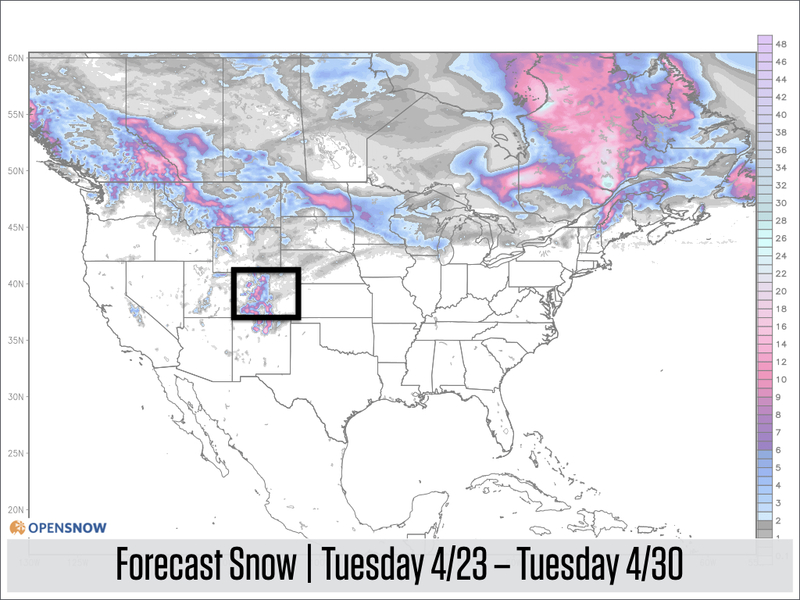 The 7-day snow forecast from Tuesday, April 23 to Tuesday, April 30 shows most of the snow potential in western Canada, Montana, Wyoming, Colorado, and northern New England. The snow totals look impressive for Colorado with 8+ inches but remember that this is across 7 days of showery weather, so aside from the potential for steadier precipitation next Monday evening, no single day will offer big snow. My last daily post of the season will be tomorrow, Wednesday, April 24. If next Monday’s storm turns out to be significant, or another significant storm heads toward Colorado in early May, I will post an update. Even though my daily writing will stop after Wednesday, the hourly and 10-day forecasts for each mountain will continue to be updated every day, so of course, feel free to use our OpenSnow website and app for your spring skiing adventures. And as we transition into hiking, please check out OpenSummit.com which is our summer app that has precipitation, lightning, temperature, and wind forecasts for the 1,000 highest and most notable mountains around the country. Right now, OpenSummit is only an iPhone app and we are working to make it a website and an Android app by late spring or early summer. Also, in the next few weeks, we will combine the All-Access subscription ($19/year) for OpenSnow and OpenSummit so that ONE subscription provides All-Access to BOTH apps!